Light Sensors tells your automatic headlights to turn on if your vehicle is so equipped. The sensor is located on top of the dashboard and near the windshield. If your vehicles headlights come on automatically at night, you have a light sensor. A small opening will be made in your dashcover to allow the sensor to function. Climate Sensors helps determine the cabin temperature. If you have climate control, the AC/Heating control knob will have numbers (temperature settings) and the AC or heater will come on automatically to maintain the selected temperature. 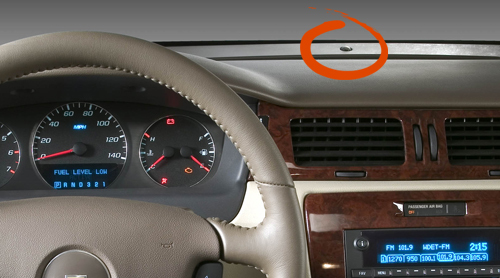 The sensor is usually located on top of the dashboard and near the windshield. A small opening will be made in your dash cover to allow the sensor to function. Navigation system typically a small monitor on the dashboard to display maps and other information. The question of Navigation refers to original equipment, not after-market. If you have had an after market system installed on your dash, you will have to remove it and reinstall after installing your dashboard cover. Heads Up Display ( H.U.D) displays vehicle information from the dashboard projected towards the lower part of your windshield. Like a reflection in the glass. Parktronic Ultrasonic Park Assist - A row of indicator lights located on top of the dash board to show how close objects are to your bumper. Q: The DashMat covers the speakers on my dash. Will that distort the sound? A: No. In fact, your speakers need more protection than your dash. The sun breaks down the speaker materials which will cause loss of sound quality. The DashMat material allows the sound to flow through without any distortion. Q: How do I attach the DashMat to my dash? A: We provide two 9" strips of hook and loop fastener tape. Cut it into 1" pieces and place them evenly on your dash. Q: What if my hook and loop fastener tape doesn't stick to my dash? A: This is usually caused by use of Armor protectant. To get your tape to stick use a mild detergent or rubbing alcohol on a towel and wipe the dash clean. You may need to repeat in certain areas to get the tape to stick. Q: Will the hook & loop attachments strips damage my dashboard? A: No. If you want to remove the hook & loop attachment strips simply pull them off. If there is any sticky residue remaining use some rubbing alcohol on a cloth to remove the residue. Show your personality by adding an embroidered logo from your favorite team, character, vehicle or organization. DashMat offers more than 165 specialty logos that you can add to your DashMat. Customize your DashMat with your favorite saying. "Play Ball" or "Lets Go Hunting" are some of the great monograms to put on your DashMat to show your friends your personality. Create your own saying or add your nickname, its up to you. Let the world know how you feel. Each DashMat is custom made. We buy your specific cars dashboard, our craftsmen make a custom pattern, and then we make samples until we get a perfect fit. Join the 1,750,000+ people like you who choose to protect their vehicles dash from the damaging rays of the sun with a DashMat. Get your DashMat today! We are proud that our products are designed in the USA. Windshield haze is caused by gases leaked from your vehicles dashboard. A new DashMat helps eliminate these gases (called Plasticizer Migration) from fogging-up your windshield. The suns damaging rays can crack your dashboard. With the simple protection of a DashMat you can keep your interior looking better longer. It will also help keep the resell value of your vehicle higher. An ugly crack in your dash is easily avoided when you get a new DashMat. Protection couldn't be easier. NOTE: see FAQ below for comments on attaching the DashMat to your dashboard. Our craftsmen say DashMats are made of durable, color fast, non-shrinking needle-punch carpet. Simply put, we use high quality materials that have been proven to protect your dash from the damaging effect of the sun. That is why we give a lifetime warranty. Darker colors reflect the least amount of light, and will give the least amount of windshield glare. DashMats standard procedure is to put embroidery and logos on the passenger side, however, there are exceptions, If a dashboard is completely or mostly flat they will put them in the center of the mat, halfway between the driver and passenger. Depending on the way certain dashboards are designed there sometimes isn't an ideal location to add them for good visibility, but they try to position them where they can be easily seen. * Note: Most In dash speakers are not cut out of the dash covers ( unless raised high ) because the fabrics do not distort sounds. DashMat-like fabrics are used as speaker covers by stereo component manufacturers. All late model vehicles equipped with passenger side air bags, there is a slit made in the dash cover, required by law in case the air bag needs to deploy. For maximum windshield glare & reflection reduction we recommend darker colors only. A - Be sure the mat is pushed all the way back between the glass and the dashboard. The vent cutouts should match the defrost vents. If necessary, use a wooden ruler or paint stick to push the mat into place. B - Because of auto assembly tolerances or variations in the position of replacement windshields, DashMats may require trimming on the windshield edge. The adhesive backing won't stick to a dashboard that is dirty, dusty or has vinyl or polish protectant applied. Thoroughly clean all areas with a mild detergent or rubbing alcohol (see step #2 on page 1). Speaker areas need extra protection from the sun so we do not cut out for them. The sound comes through the DashMat fine --just try it and see! The DashMat is usually marked for these on the underside, but not usually pre-cut. After checking the automatic headlights, digital climate control or alarm sensor markings against the actual sensor position,you may cut the marked area with a sharp utility blade or scissors. Remove the DashMat from the dashboard before cutting. The DashMat is often marked for these but not pre-cut. If your vehicle requires the cutout, use scissors or a utility blade on the lines indicated. Remove the DashMat from the dashboard before cutting. A few car models are known to have this problem. This occurs when the plastic formulation inside the dashboard begins to break down and migrate or flow. This results in a darkened burnt-looking area appearingm on the top of the dashboard. This indicates a weakness inside the dashboards of certain model years (primarily older vehicles) and may occur on both covered and uncovered dashboards. DashMat assumes, no responsibility for such incidences. fasteners to this area since they could (or would) restrict proper airbag deployment.